Male Humpback Whale song is transferred from year to year and evolve in a similar fashion to the verbally transmitted tribal lore of Aboriginal cultures from where the term Songlines is derived. can be heard over great distances. Each year the whales sing a new song. Haunting melodies of radiant joy which fill the ocean along the East Coast of Australia. When environmental systems across the planet are collapsing and species are becoming extinct at an accelerating rate, the East Australian Humpback Whales are making a remarkable recovery. They have become Australia’s national treasure and a symbol of hope for our imperilled environment. 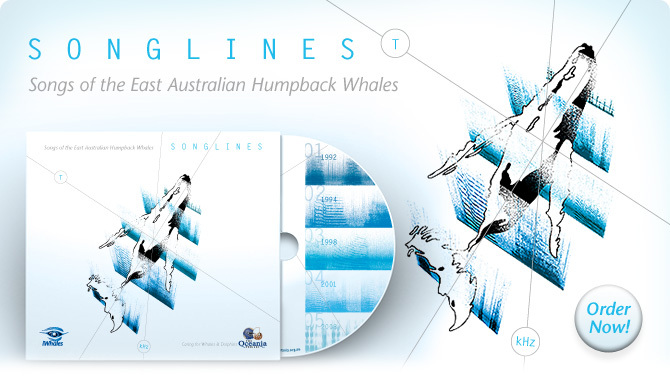 Songlines documents the evolution of the intricate and beautiful East Australian Humpback Whale song. An hour of pristine digital audio recordings selected from five different years between 1992 and 2008 which draw the listener into a mysterious and majestic ocean world. Track 3 features white whale Migaloo, recorded in 1998.